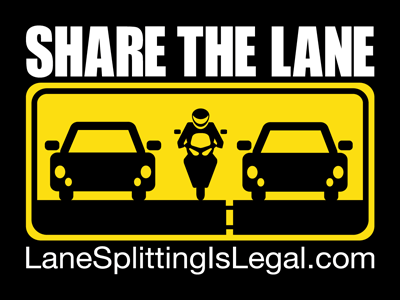 Support LaneSplittingIsLegal.com and send a positive message about splitting lanes & sharing the road. This is all about getting the word out, and the more stickers there are out on the roads, the more informed drivers will be. Put ’em on your bike, car, truck, laptop… whatever. The more visibility, the better! 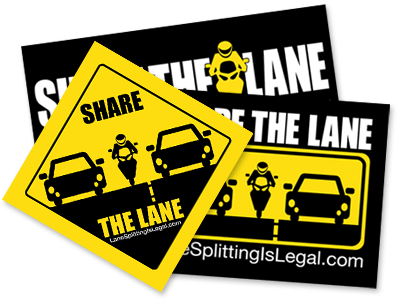 Support LaneSplittingIsLegal.com and get all three lane splitting sticker designs! Put ’em on your whole bike collection and your car/toolbox/laptop/etc. Durable vinyl stickers with UV coating to make it last. Every purchase of a support pack helps to fund free stickers at bike shops and events, which helps get the word out. Starting at $15 – buy more and save! Stickers ship for free in the US! New design! We’ve had a lot of requests for the road sign design as a sticker, and we listened. Here it is! 3″ x 3″ yellow road sign sticker is highly visible and made of durable vinyl with UV coating to make it last. Starting at $3 – buy more and save! 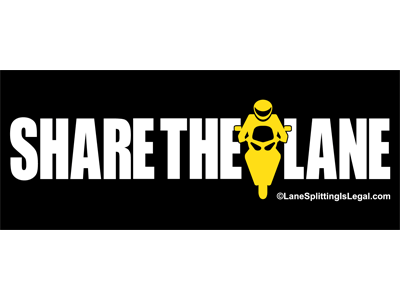 Updated “Share The Lane” design sends a positive message to your fellow motorists and the LaneSplittingIsLegal.com URL reminds California drivers that splitting lanes is legal in the Golden State. Durable 4″ x 3″ vinyl sticker with UV coating to make it last. 5″ x 2″ size is perfect for your topcase or side covers. 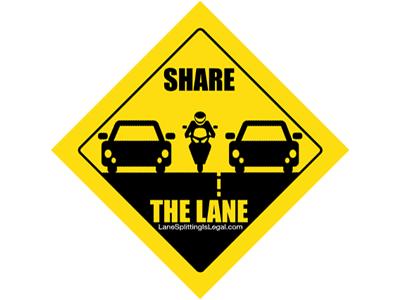 “Share The Lane” message works whether you’re in California where splitting is legal, or trying to make a statement in other states like Nevada where lane splitting isn’t quite legal… yet. Durable vinyl sticker with UV coating to make it last. $3 each – buy more and save! Our lane splitting stickers are shipped from LaneSplittingIsLegal.com HQ in Oakland, CA via USPS. We ship ’em out as soon as we can – generally within 24 hours of your order. Free shipping is for the US only – if you want stickers shipped outside the US, or have any questions, contact us and we’ll figure it out. If you’d like to support the cause by purchasing a large quantity for your shop, club, or organization or just to plaster on road signs everywhere 😉 contact us and we’ll get you special quantity pricing.